ST. PAUL, Minn.--(BUSINESS WIRE)--Small business owners planning to exit their businesses for retirement or other reasons may be in for a rude awakening. New research conducted by Securian Financial Group shows the vast majority of small business owners are unprepared for exiting their businesses. The financial ramifications, especially for business owners counting on their companies to fund their retirement, could be significant. The study found that 50 percent of small business owners want to sell their business to a partner, key employee or third party, while 37 percent want to transfer the business to family members. 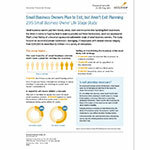 Six hundred small business owners with an average of 27 employees and annual revenue ranging from $250,000 to more than $20 million were surveyed in August and September 2015 for the Securian Small Business Owner Life Stage Study. More information is available at www.securiannews.com. Since 1880, Securian Financial Group and its affiliates have provided financial security for individuals and businesses in the form of insurance, investments and retirement plans. Now one of the nation’s largest financial services providers, Securian is the holding company parent of a group of companies that offer a broad range of financial services.